Blackjack Pro is an online casino game that has been developed by Playtech and is available at La Isla Casino Tropez. You can play the demo version above or sign up at the casino and get a welcome bonus to play the game for real. 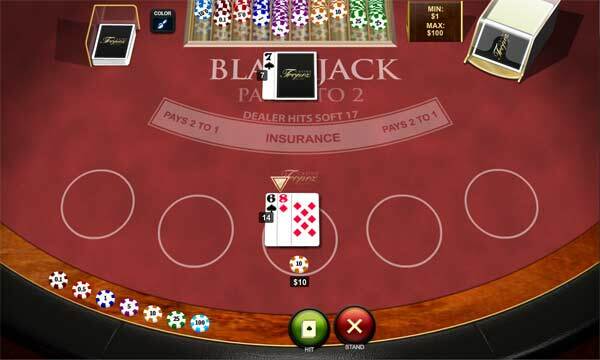 This version of blackjack follows most of the standard rules of the regular blackjack 21 game. There are a few differences that I will explain for you here. You can play anything from 1 to 5 hands on a blackjack pro table. The game is designed for what Playtech class as intermediate players. The main differences between this and standard blackjack is that you cannot split an already split hand, and you can only "double down" if your card values are 10 or 11. In this version of blackjack the dealer must always hit on a soft 17, and after every hand the cards are returned to the pack shuffled.